Growing tomatoes in pots is nothing new. This is a great way to enjoy your favorite crops in areas with limited space. Tomatoes can be grown easily in hanging baskets, window boxes, planters, and many other types of containers. To successfully grow tomatoes in pots or containers, simply match the variety you want to a suitable container and provide the proper care. 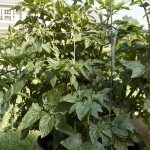 It’s easy to grow tomato plants in pots. To get the most from container-grown tomatoes, you need to match the eventual size of your plant tomato plants to the overall size of your container. For instance, smaller varieties are well suited to hanging baskets or window boxes, whereas you might want to choose a sturdier planter or 5-gallon bucket for larger types. Make certain the pot is deep enough to accommodate the plant’s root system. A standard 12-inch deep pot with the same diameter is suitable for most plants. Anything from bushel baskets and half barrels to 5-gallon buckets can be used to grow tomato plants. Just make sure that the container has adequate drainage. Fill your pot with loose, well-draining potting soil. It’s also a good idea to add in some organic materials like well-rotted shavings or manure. For example, you might try an equal mix of potting soil perlite, peat moss, and compost. Tomato seeds can be started indoors in early spring or you can purchase young plants once they become available in your area. 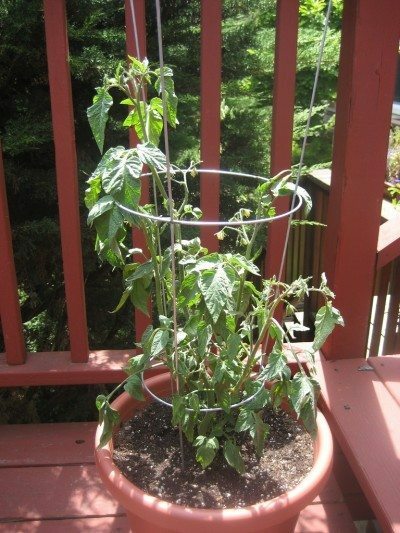 For tomatoes that require staking, you may want to add the cage or stake beforehand. Place the container in full sun, checking them daily and watering as needed—usually weekly with more frequent watering during hot or dry spells. Begin using a water-soluble fertilizer about every other week during midsummer and continue throughout the growing season. Growing tomatoes in pots is easy and can yield just as much as those out in the garden.